The 12 days Karamoja culture, wildlife & gorilla safari takes one to the interesting Karamoja region which offers the memorable culture and the people as well. Karamoja is located in Northeastern Uganda. The region has several cultural tribes like the Ike, manyatta, gea, Dodoth among others. 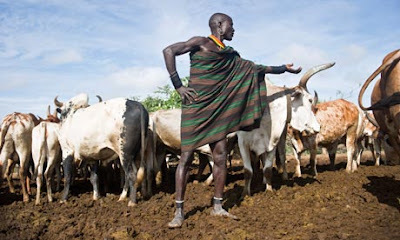 On this Karamoja cultural tour take a visit to the Kidepo Valley National Park which is ranked as the 3rd best Park with abundance of different wildlife species in Africa. On your visit to this park various wildlife species can be spotted on game viewing drives due to the two game drive in different Parks. After being filled with the various cultural festivals, African wildlife from Kidepo and Murchison Falls National Park then go to the Bwindi Impenetrable National Park because of the impressive Uganda gorilla safaris, Uganda gorilla tours, Uganda gorilla tracking as well as gorilla tracking experience deep into the thick Forest! Bwindi is known as the best place to see the Gorillas, with almost half percentage of the endangered remaining mountain gorillas! After your breakfast from your hotel, we will meet our guide driver for a brief talk about the safari then embark in our safari vehicle and drive to the Kidepo Valley National Park which is famous for diversity of the wildlife species obtainable. Then take a break at Gulu/Kitgum town for dinner and overnight at Bomah Hotel Gulu/Fugly Hotel Kitgum. After breakfast we travel to the largest and most beautiful National Park in Uganda with very many wildlife biodiversity. Upon arriving at Murchison Falls National Park we visit top of the magnificent fall and reach a point where it rains every day then we check –in at our lodge for dinner and overnight thus evening is at leisure. Budget: Fort Murchison, Mid-Range Fort Murchison, Luxury Paraa Safari Lodge. Breakfast then a game drive searching for the African wildlife mammals like the lions, elephants, buffaloes, giraffes, water and bush buck, Uganda Kob, Topi, Oribi, warthogs, among other antelopes. Game drive activity takes about 3-4 hours and return to lodge for lunch. Thereafter in the afternoon we crowd at the starting point of the boat cruise at the River Nile, take boat cruise along River Nile towards the falls of River Nile and while on this activity expect to spot wildlife, sightseeing like land forms cliffs and birds like Shoebill stork at the Delta and other bird life species. After being filled with the boat cruise experience return to the lodge for dinner and overnight. Have breakfast, we will transfer to Kibale Forest National Park and on your way having lunch in Hoima town and later drive to Fort portal in Kabarole district for your dinner, overnight stay and depending on the time arrival evening at leisure. Budget: Chimp Nest, Midrange Kibale Forest Camp, Luxury: Kyaninga Lodge. We will transfer to park headquarters and be briefed about the chimpanzees and other primates in the forest as well. After we will start off the activity in the forest for searching the shy chimpanzee and other primates like the white and black Colobus, Vervet monkey, red tailed monkey the live in this forest. Drive to Garden Restaurant for lunch and after resume with our drive directly to Bwindi impenetrable National Park. Where you will have the unforgettable gorilla tracking experience in the mist, then Dinner and overnight. Gorilla Permits @ 600 dollars per head.